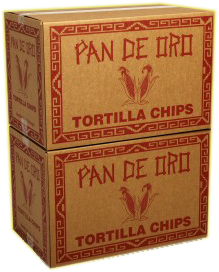 Interested in selling Pan De Oro in your store or serving them in your restaurant? Severance Foods, Inc. is a nationally renowned manufacturer and co-packer of tortilla chips. All of our products are Non-GMO Verified, Certified Organic, Certified Gluten-Free, Certified Kosher Kof-K, and Certified Vegan. Our tortilla chip products come in cases of 12 7.5-Ounce bags. They can either be picked up at our facility in Hartford, Connecticut or delivered through a distributor. For available distributors in your area, contact us by phone at (860) 724-7063, or complete the form under “Contact Us” above and we’ll get back to you as soon as possible. We also offer our products factory-direct with prepaid UPS Ground Shipping. For pricing, contact us by phone at (860) 724-7063, or complete our contact form and we’ll get back to you as soon as possible.